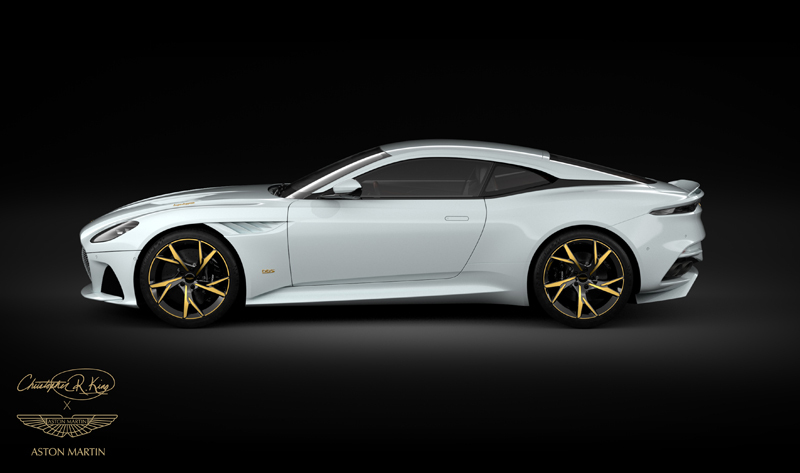 CCCXXXIII founder Christopher R. King recently revealed the result of his collaboration with Aston Martin. Through his ultra-luxury fashion house, King has in the past unveiled a unique series of luxury accessories that are designed and marketed to the very discriminating and produced in very limited numbers. This is King’s first foray into the automotive world. The production is just as limited as the upper tier of his series of executive necessities; the exclusive run is limited to three vehicles—King’s lucky number. The model chosen for bespoke treatment is a knockout: the 2019 DBS Superleggera. The 2019 DBS Superleggera model signals the end of the regular-production naturally aspirated V12 for Aston as emissions standards tighten globally. Like other high-end car manufacturers ending production of this iconic powerhouse, Aston wanted to send it off brilliantly. And they managed that, didn’t they. In profile, the 2019 DBS Superleggera is staggeringly lovely, with a long front end, and a windscreen that rises into a graceful crescendo of a roofline before falling away to a forceful ending. Unlike the production model, King’s Superleggera features a painted roof, as well as side louvers, rear bumper, and rear diffuser. A choice of white, yellow, or rose gold accents enhance the prevailing high-design cachet and offer a measure of contrast, but the effect is generally cloud-like. No ordinary hardware will do; the badges on this Aston Martin are gold-plated. Further, the grill is hand-masked and hand-painted with painstaking precision for an unmistakable custom finish. Fittingly, King’s custom 2019 DBS Superleggera features a custom color: Kingsway White. The name is the result of baffling serendipity: Kingsway is the road leading to Aston Martin’s headquarters in Gaydon, UK. Taken in context, it was a natural fit. Perhaps the fortuitous coincidence was another sign from the universe; King’s notoriety has been on the rise since CCCXXXIII entered the luxury market at the very top. While the exterior carries an understated air of prestige, the interior is more overtly jaw-dropping. King’s vision called for a great deal of wood—the most, in fact, to ever grace the interior of an Aston Martin in modern era. It looks like figured mahogany, and the satin-matte finish is spectacular. The color palette is tastefully reserved and complements the choice of materials nicely. The appearance, per King’s order, should suggest a classic cigar boat. The trunk storage unit, which is also walnut, is designed to hold bespoke CCCXXXIII luggage, giving the car and the company a nice sense of cohesion. The result is an instant collector’s item that should be arriving in the spring of 2019. No word on pricing, but it is rumored to be in the $500K-$600K range.